Niterói is the world’s second city with the largest number of works designed by architect Oscar Niemeyer, only losing for Brasilia. It houses, on a plot by the sea, a popular architectural complex aiming at promoting art and culture. Together with MAC, its buildings form a path along the seaside, called Niemeyer Way. The Path currently comprises seven urban facilities. The Roberto Silveira Memorial houses a memorial center in honor of Rio de Janeiro’s history and literature. A concrete dome that seems to emerge from the ground. It is all so simple that the visitor is fascinated by the details of its interior. The Memorial houses a wide and important historical collection of the State of Rio de Janeiro, with little over 200,000 scanned works, an auditorium for events and a panel made by artist Claudio Valerio Teixeira. The Museum of Science and Creativity – House of Knowledge. The building is divided into two blocks and was built on a water mirror. This dome is snail-shaped, and its main ramp directly leads to the mezzanine reserved for exhibitions. There is a strong echo inside! Oscar Niemeyer liked his works to play with sounds. The second half-moon-shaped block is a combination of glass and concrete. The Oscar Niemeyer Popular Theater. It has room for 460 people and is a unique artwork, with countless architectural details. That’s the Popular Theater. The building has a wavy-shaped roof, which resembles the shape of the sea waves, when seen from above. It was the architect’s brilliant innovation, with a unique stage infrastructure, dressing rooms and technical resources, including a reversible stage, which can be used for an indoor audience or opened in a square, supporting outdoor shows for up to 10,000 people. 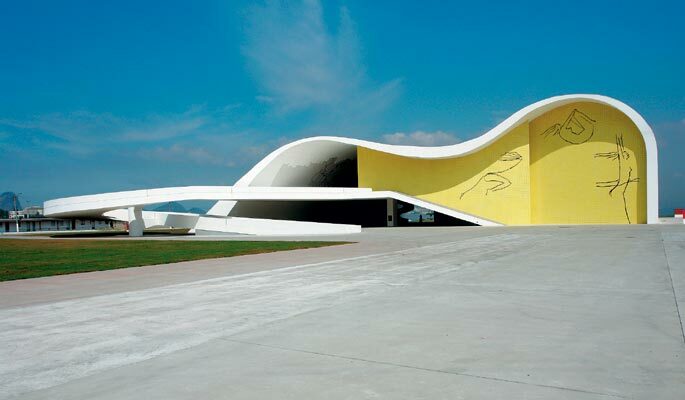 The frontege of the building displays ceramics with Niemeyer’s drawings picturing female shapes as an analogy to the curves of the theater itself. Next to the Popular Theater there is another building inspired by Oscar Niemeyer’s works: the Niterói Tourist Center, at the beginning of Niemeyer Way. The Path goes on through the seaside of Guanabara Bay, walking past Juscelino Kubitschek (JK) Square. There you may find the statues representing the architect Oscar Niemeyer and the former President Juscelino Kubitschek. Following the seashore, you reach the Petrobras Cinema Center. It is in São Domingos, a neighborhood with some works with historical relevance to the city: the Cantareira and Leoni Ramos Square, Petrobras Cinema Center, designed by the architect Oscar Niemeyer in a film roll-shaped format, has 5 cinemas rooms, a coffee shop, a bookstore and an arts gallery. The newest area of the city has been emphasizing Niterói’s cultural and artistic vocation. Keep on walking by the seaside and you will find the Museum of Contemporary Art. Like a flower, MAC “rises” from the ground on a single cylindrical base supporting the entire building, anchored in a giant shoe. A water mirror is the final touch to its look, providing the building with the sense of lightness. The large external red concrete ramp leads visitors through free curves up to the entrance of upper floors. The reception and administration floor are in the first entrance. Right above, the second floor houses the central exhibition hall surrounded by a circular glassed balcony, also dedicated to exhibitions, where you can admire the panoramic view of Guanabara Bay. Following the seashore, you will find another important work made by the architect: the Charitas Waterway Station. One of the highlights of this building is the setback from the station to the waterline and the pier built on piles where the catamarans are moored. The building has an area of two thousand square meters and seven hundred square meters of glass making the passenger boarding panoramic hall.